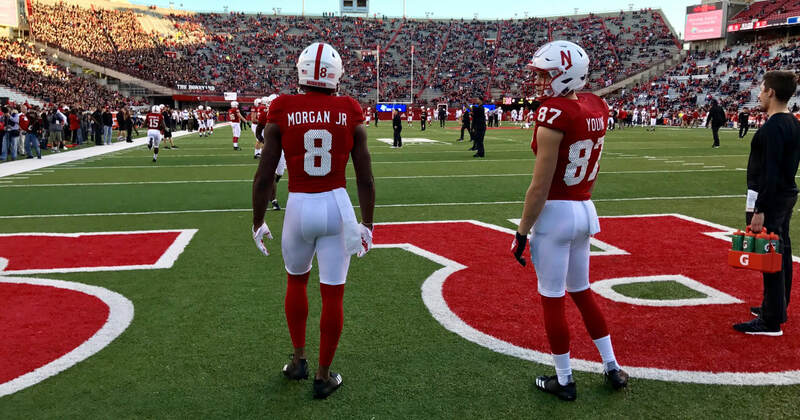 In what turned out to be a less-than-awesome “throwback,” the University of Nebraska wore 1997-tribute uniforms yesterday, meant to replicate the “mesh” style that team wore. In one sense, the throwbacks were pretty accurate — it was difficult to tell, even in closeups, that those uniforms were made of mesh. It was easier to tell when the unis were soaked in sweat, as you could see the full pads underneath. Yesterday’s uniforms were “normal” fabric, but the numbers were screen-printed to replicate the look of the numbers on a mesh jersey. Back in the day, it was difficult to tell from distance the numbers were on a mesh jersey — yesterday it was also tough to tell. So in that sense, it was mission accomplished. They seemed to get all the details correct, including the patch, but it just didn’t scream “mesh” to me at all. That’s probably a very good thing. 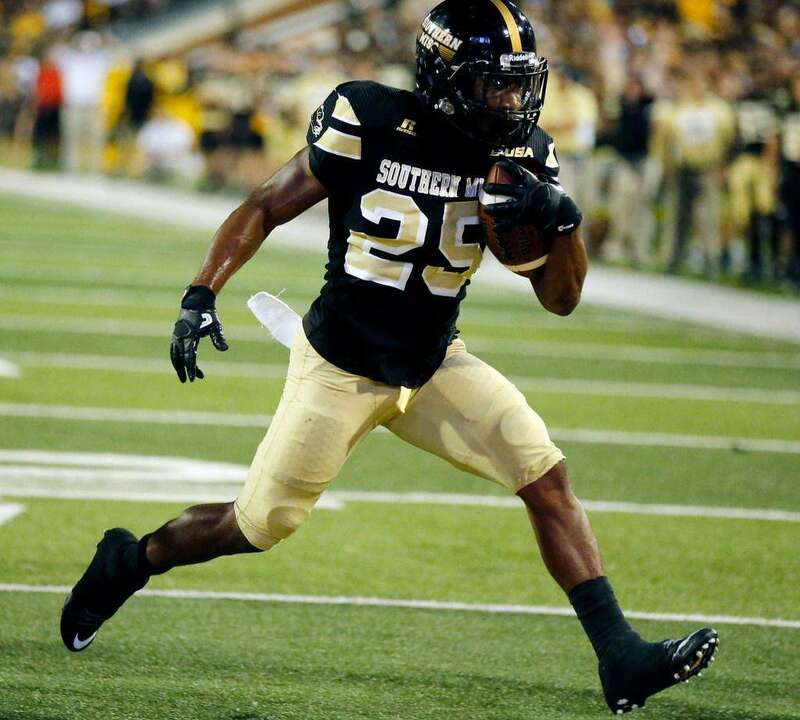 Before we begin, a little note: in efforts to find photos for last week’s post (sometimes, it proves to be more difficult for no clear reason), I completely dropped the ball on an important game from last week, and that was Southern Miss wearing their 1997 throwback uniforms against North Texas. The unis were in honor of the 1997 team that went 9-3, won the Conference USA championship, and beat Pitt in the Liberty Bowl. Sometimes, I will miss a game or two, but I wanted to point out this game for how sharp the Golden Eagles looked last week. My bad. OKAY! On to October football, which was Homecoming week for a lot of schools. 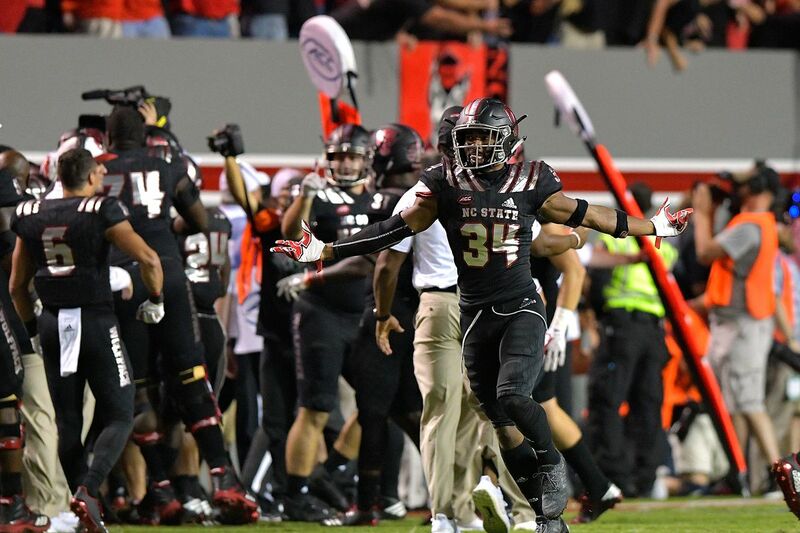 • HO-LEE SMOKES, NC State took their Week 5 look and took it a level beyond a Super Sai— oh, who am I kidding? It’s not THAT bad (compared to what they wore last week, at least). You know how –as proven with UCLA’s last few years with Adidas since 2010 (first year of the Laffy Taffy togs)– the moment you think things can’t possibly get any worse, you’re almost instantly proven wrong? 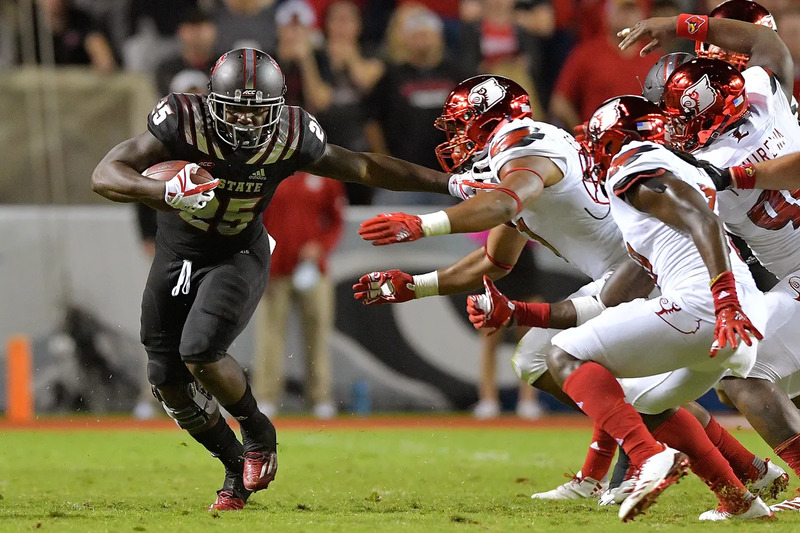 The Wolfpack kind of went the opposite direction for Week 6. In addition, given that Halloween is basically celebrated all-month long these days, it’s an excellent costume that encompasses the holiday spirit. “Costume” being the operative word, of course. That said, I want to talk about the Northwestern stripes that look like something Piccolo would wear: several people accused Adidas of class-S logo creep, but if that were the case, all three stripes would be thin and equal to each other in size (we can use literally any soccer kit made by Adidas for reference, or a lot of the past NBA All-Star uniforms). I think Paul said this a long time ago, but sometimes, three stripes are just three stripes. • A player from Northwestern was ejected for targeting, and a handful of readers spotted that the Wildcats were still using the old Big Teneleven logo (PC: J. Colbert) from years back on the doors at the end of the tunnel off the field, and I think I know why: it’s hard to see, but if you look at this photo provided by Jerry Kulig, you can sort of make out ‘1995 CHAMPS’ and ‘1996 CHAMPS’, which were the back-to-back years that Northwestern were indeed Big Ten champions (co-champs in ’96), so the logo is most likely a reflection of what was used at that time. Speaking of which, they wore purple/black/purple in their Homecoming game against Penn State. I swear, they’re one of the few (if not only) teams that can wear black and purple (no grey or anything else apart from white), and actually look good doing it. • Oklahoma wore the all-crimson version of their alternate home uniforms against Iowa State, who wore white/white/cardinal: a fine look for the Cyclones. As for the outcome, let’s just say that the Sooners dressed for the occasion, because they were definitely seeing red. • Temple wore black gradient helmets and black pants against East Carolina, who wore mono-BFBS. The numbers are incredibly bland, and seem out of place in context with the rest of the uni. • In the Battle of the Piney Woods, Stephen F. Austin and Sam Houston State wore their home uniforms (as usual). That’s the best photo I could pull up unfortunately, but as you can see, the Lumberjacks wore white/purple/white, and the Bearkats wore all-orange. 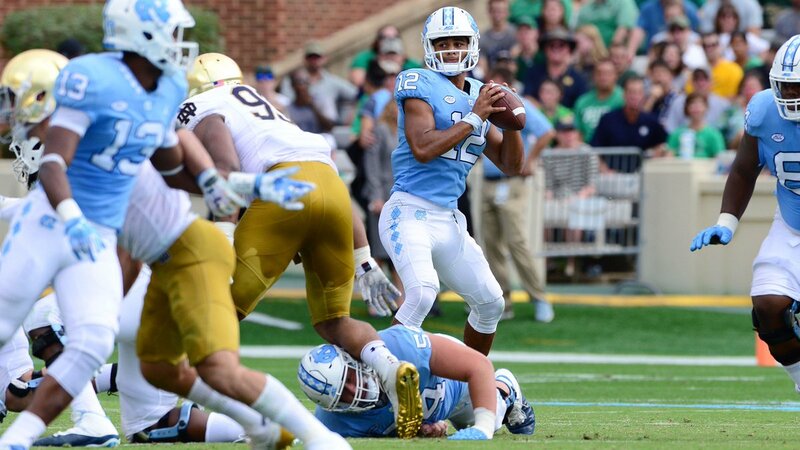 • North Carolina wore white/blue/white against Notre Dame. 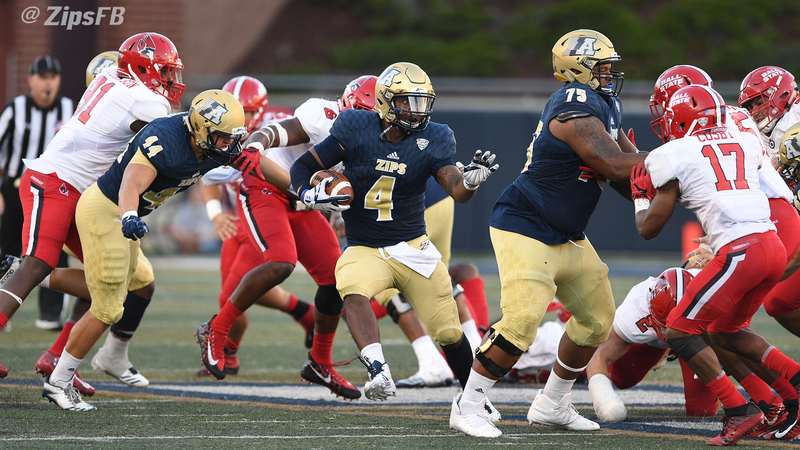 • Akron wore these throwback helmets in their Homecoming game against Ball State. • Fonty McFontFace/@thefontsavant spotted an interesting NOB treatment in the Boston College/Virginia Tech game. That’s Eagles Senior kicker Maximilian Schulze-Geisthovel, who hails from Germany. In addition, VT wore white facemasks with (IMO) their best road look in that same game. They also wore these decals in honor of the victims of the recent events in Las Vegas. • Conversely, UNLV wore these decals over black jerseys and white pants in honor of the victims. 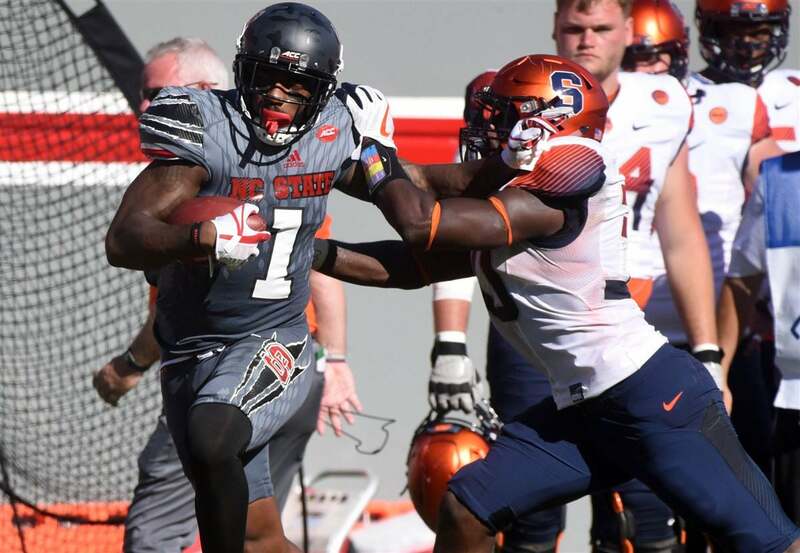 • Ohio State wore pink accessories for Pinktober in their game against Maryland. • Wisconsin wore white facemasks (normally red) against Nebraska, who wore their retro uniforms honoring their 1997 championship team. Of course, some Huskers screwed the pooch by not wearing the compression shirts with the striped sleeves. • UAB wore these uniforms in honor of Children’s Harbor, which has two locations in Alexander City, AL, as well as nearby Birmingham. Each athlete wore the names of the children they spent time with earlier in the week. • These days, what’s old is new again. S/O to Benji King/@benjiking for the photo. • Kentucky in dark grey is nothing new, but I think that this is the first time that they’ve worn matching facemasks (closer look). • Michigan State wore all-white against the Wolverines. • Utah wore their hybridback uniforms for their Homecoming game against Stanford. • Washington wore their normal gold helmets in warm-ups, but come game time, they broke out some (presumably) new purple chrome lids for their Purple Reign campaign. Erik Gambord/@ErikRGamborg says it best. That’ll do it for Week 6! For those in Tropical Storm/Hurricane Nate’s path, I hope you all stay safe, and I’ll see you next week. Following in the footsteps of the original “5 & 1,” Jim Vilk, and Catherine Ryan after him, Joe Ringham is back again for 2017 to make his “5 & 1” (five good looking and one stinker) uni-vs-uni matchups. Sometimes he’ll have some “honorable mentions” and sometimes there will be more than one “bad” game. You may agree and you may disagree — these are, after all, just opinions and everyone has one. Feel free to let him know what you think in the comments section. 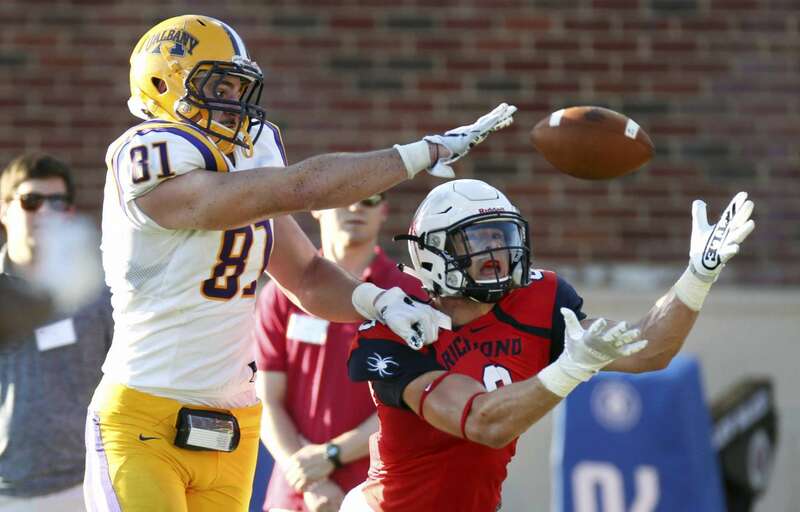 5) Albany at Richmond — We head to the FCS to start this week. The gold/white/gold of Albany contrasted wonderfully against the white/red/white of the Spiders. Such an eye-pleasing game. 4) Central Michigan at Ohio — Not gonna lie, I had a feeling this one might be on the wrong side of this list based on the Chips going with their maroon/mono-gold look (a yearly +1 fixture for me). But, upon seeing the Bobcats going white/green/white, this falls into the “so bad it actually looks good” category. 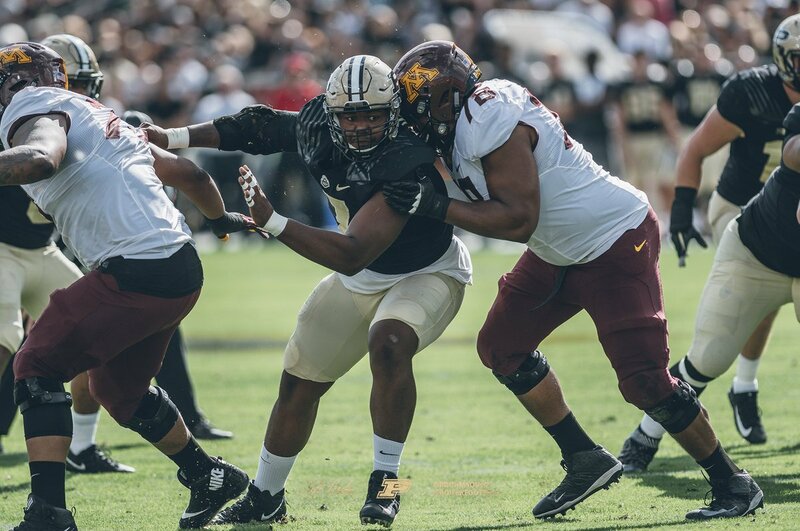 3) Minnesota at Purdue — When searching through some of the mid-afternoon games, this one really stood out strong. Loved the Gophers going maroon/white/maroon on the road in West Lafayette. 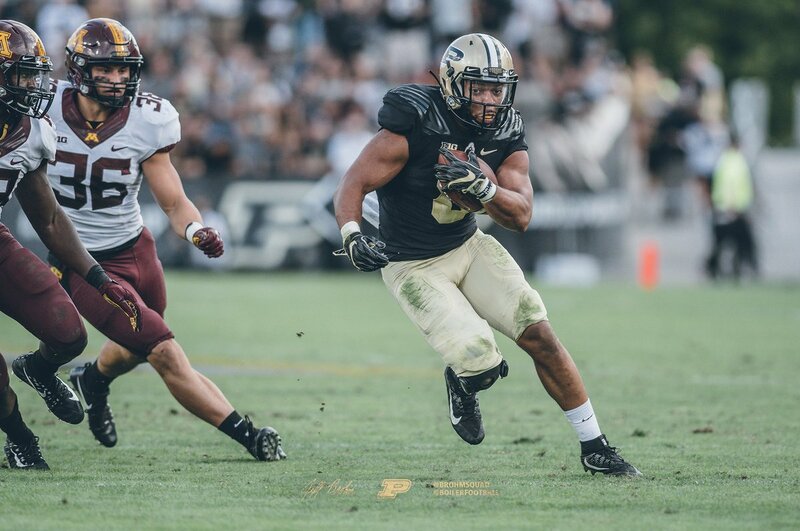 Pair that up against the Boilers traditional gold/black/gold home uni, and you have one fine-looking game on an October Saturday in the Big Ten. 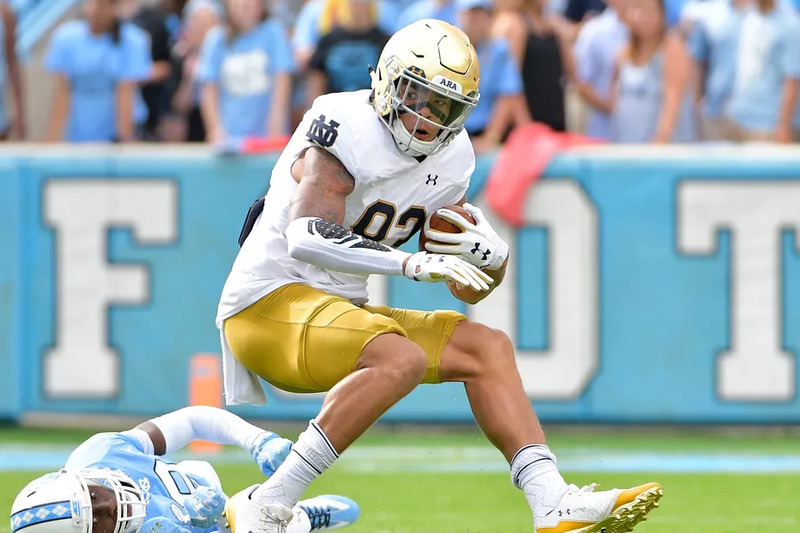 2) Notre Dame at North Carolina — I had a feeling at the beginning of the week this would look good, and it didn’t disappoint. 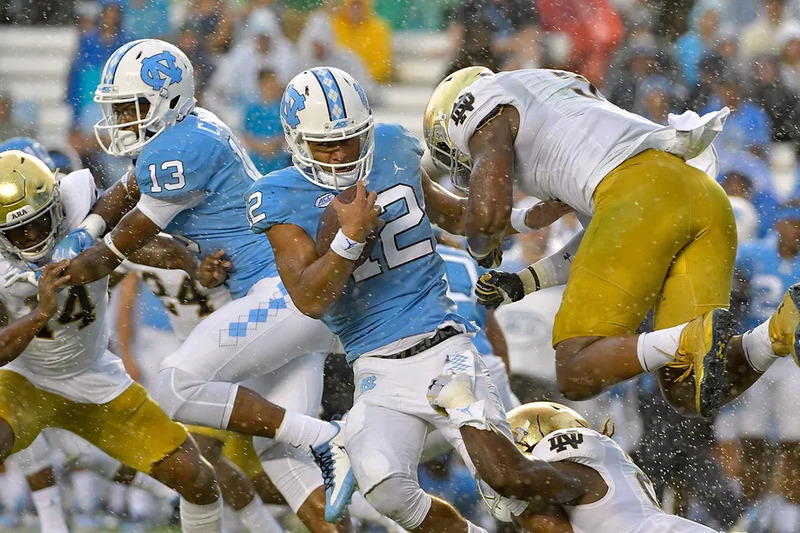 The simple, classic road look of the Irish matched up excellently against the white/Carolina blue/white the Tar Heels went with at home (a favorite of mine). 1) LSU at Florida — Always one of the best looking games of the season, and always a favorite of mine. +1) Washington State at Oregon — Is it fair to ask if the Ducks have jumped the shark when it comes to their uni choices? Enjoy your Sunday, everyone. I’ll see you all next week! Thanks Joe! You can follow Joe on the Twitter and let him know what you think of his choices or make a 5 & 1 suggestion of your own! 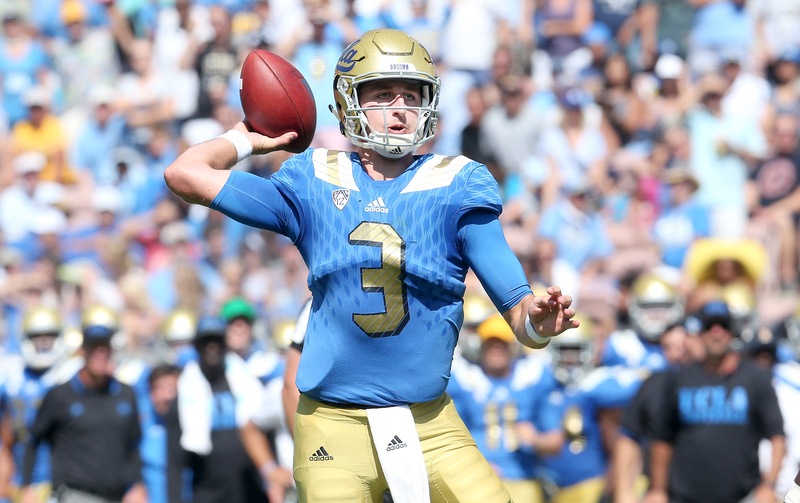 Uni Watch will again track the uniform combinations worn by the “Power 5” conferences. All of the 2016 trackers are back! We’ve got Rex Henry (tracking the ACC), Dennis Bolt (tracking the PAC-12), Kyle Acker (tracking the Big XII), and Ethan Dimitroff (tracking the B1G AND the SEC). Rex, Dennis, and Kyle and are all returning from 2015, and Ethan is back after joining the NCAA Uni Tracking last season. Ethan has stepped into the dual role of both the B1G and the SEC. Follow Dennis on Twitter here. And be sure to check out Ethan’s WVU Mountaineer Tracker. Follow Ethan on Twitter here. Follow Kyle on Twitter here. Welcome to the 2017 Oregon Ducks Uni Tracker. This little project was originally begun way back in 2008-09 by Michael Princip, who retired after several seasons, whereupon the project was continued by Tim E. O’Brien. He, too, retired from the tracking, but the project has been ably kept up by the man who also tracks the Pac12, Dennis Bolt. Hi there. Just a few days left to get our latest limited-edition shirt from the Uni Watch Artist’s Series, designed by the great Sean Kane (shown at right; click to enlarge). It’s available here through this coming Monday, Oct. 9. Additional info here. We now return you to your regularly scheduled weekend content. 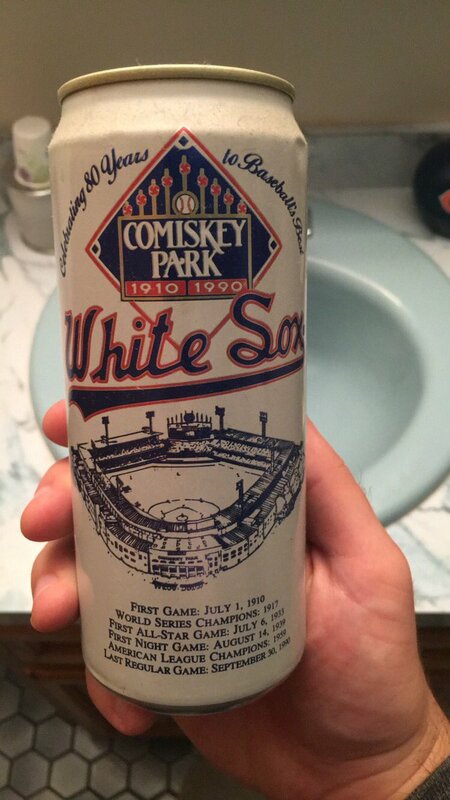 Baseball News: Check out this neat old can of White Sox beer, found by Matt Bond. 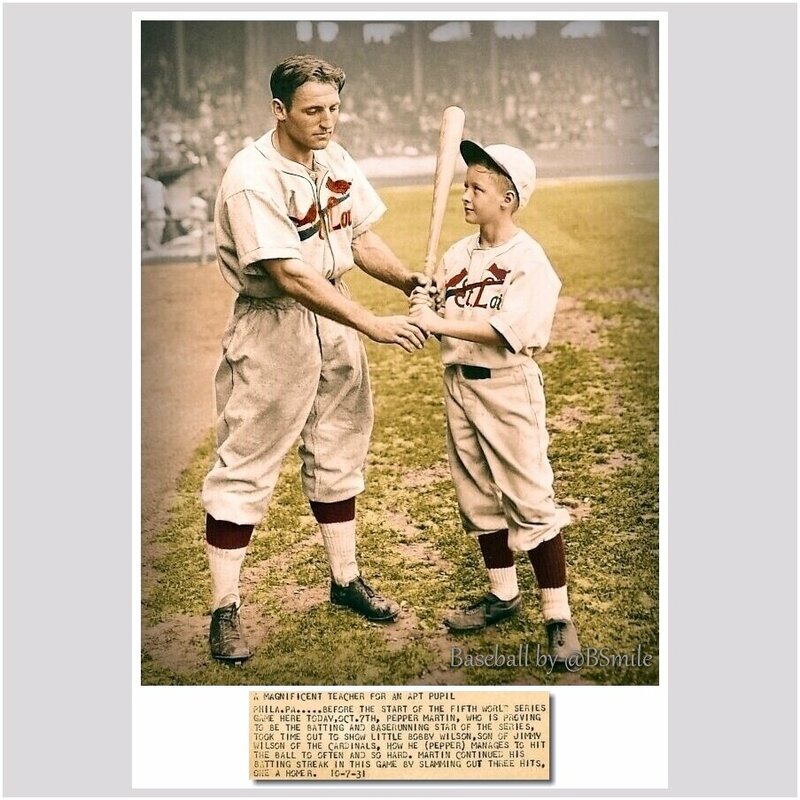 … Here’s a neat colorization of Pepper Martin giving a hitting lesson at the World Series (October 7, 1931). As Bruce Menard says “Great STLCards uniforms!” … When you hear the name Duke Snider, you think Dodgers, maybe Mets, right? But (and I didn’t even know this), @UniformCritic unearthed this photo of Duke Snider as a Padre (supposedly a coach). Here’s the tweet. However, according to Wikipedia, “Following his retirement from baseball, Snider became a popular and respected TV/radio analyst and play-by-play announcer for the San Diego Padres from 1969 to 1971.” No mention of him coaching, but it’s doubtful a PBP guy would don a uni, right? NFL/CFL News: It started with Robert Griffin III, when the Heisman Trophy winner was at Baylor — wearing RNOB (Roman Numberal on Back). 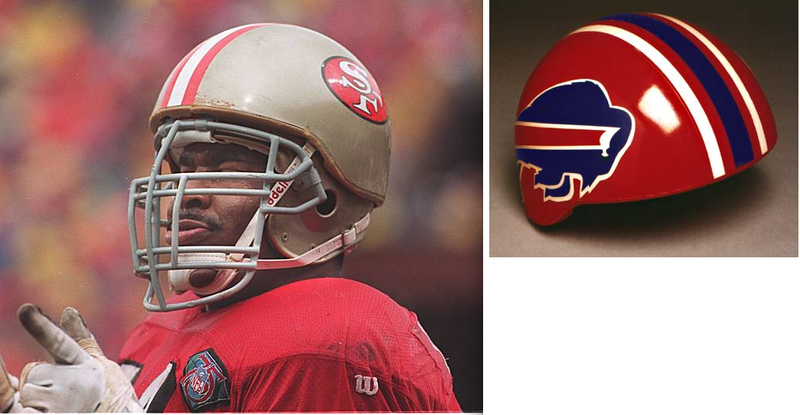 Now, the trend has spread (like a plague) throughout the NFL (I found this but it was also sent in by Mike Chamernik). … Though there is no more Pinktober in the NFL, it is back for in the CFL for the month, as displayed in Friday’s game in Winnipeg (from Wade Heidt). He adds, Winnipeg Blue Bombers backup quarterback Dominique Davis had to come into the game. 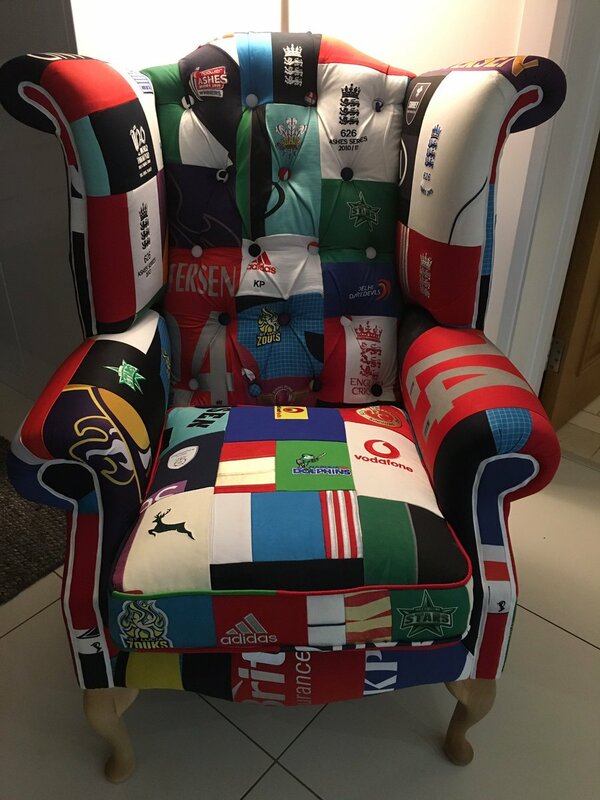 “He was wearing an older navy blue handwarmer which would date back to their uniforms before 2016. This can be seen near his left hip in this photo.” … The Bengals will be wearing orange tops over black pants today. They are very successful (4-0) when wearing this combo. They are also 19-6-1 when wearing orange tops overall. … WHOA — check out former Ohio State football star Howard Kriss modeling the Cleveland Bulldogs amazing skeleton uniform (also posted in College Football). From Bruce Menard. … The cleats the Jaguars’ Jalen Ramsey will wear today list the names of the victims of the Vegas massacre. He’ll auction off cleats with money going to the victims’ fund (via Paul). 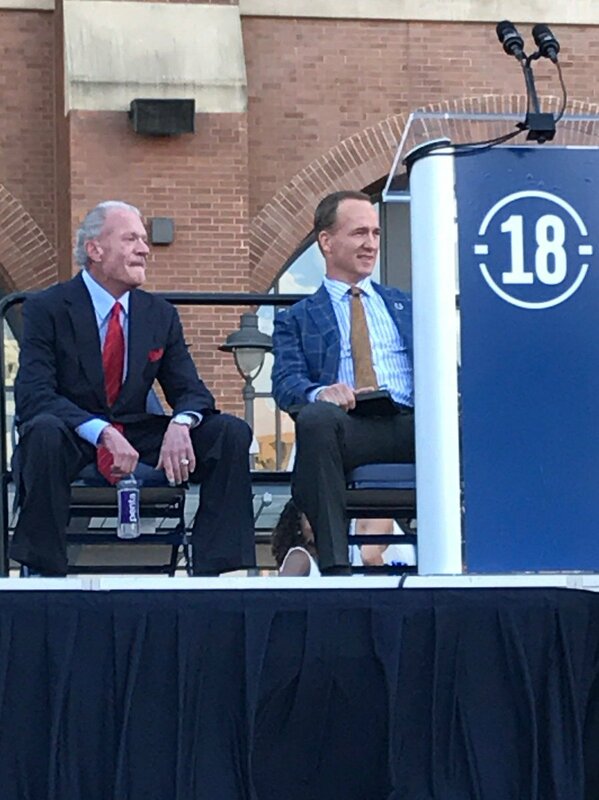 … Looks like the Colts didn’t go with the period-appropriate font for the retirement of Peyton Manning’s number (from Josh Claywell). … David Dearing has some additional observations on the Peyton statue. … The Seattle Seahawks have revealed their uniform combo for today’s game against the (throwbacking) Rams: white over white. … Robert Hayes is wondering if there will be any Pinktober shenanigans at today’s Browns game. … You’ve always wanted to see Queen’s Freddy Mercury in a Seattle Seahawks jacket, right? Of course you have (thanks to Rob Spalding). College Football News: Ole Miss students are endorsing the landshark as the school’s new sidelines mascot. In a statement Friday night, student government President Dion Kevin III said 81 percent of more than 4,100 students voted to replace the current black bear with the landshark (thanks to John Alexander). 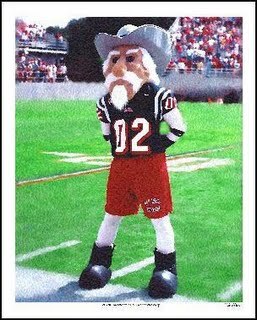 For those unaware, in 2003, the Rebels retired Colonel Reb as sideline mascot, and replaced him with the current black bear. That could all change again. 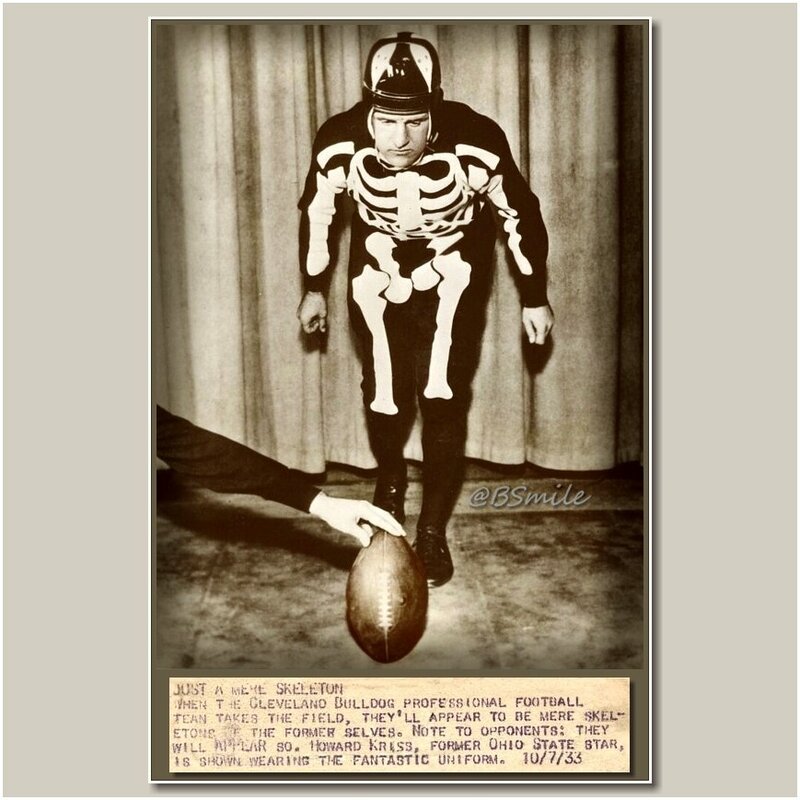 … WHOA — check out former Ohio State football star Howard Kriss modeling the Cleveland Bulldogs amazing skeleton uniform (also posted in NFL). From Bruce Menard. Hockey News: The WHL Regina Pats will host two outdoor hockey games as part of their 100th anniversary celebration – Feb. 17 and 18, 2018. Wade Heidt notes they will be at the new Mosaic Stadium in Regina. The All-Star Celebrity Classic on Saturday and a WHL regular season game against visiting Moose Jaw Warriors on Sunday. … The Hershey Bears will honor former Hershey CEO Ken Hatt with a decal on their helmet. 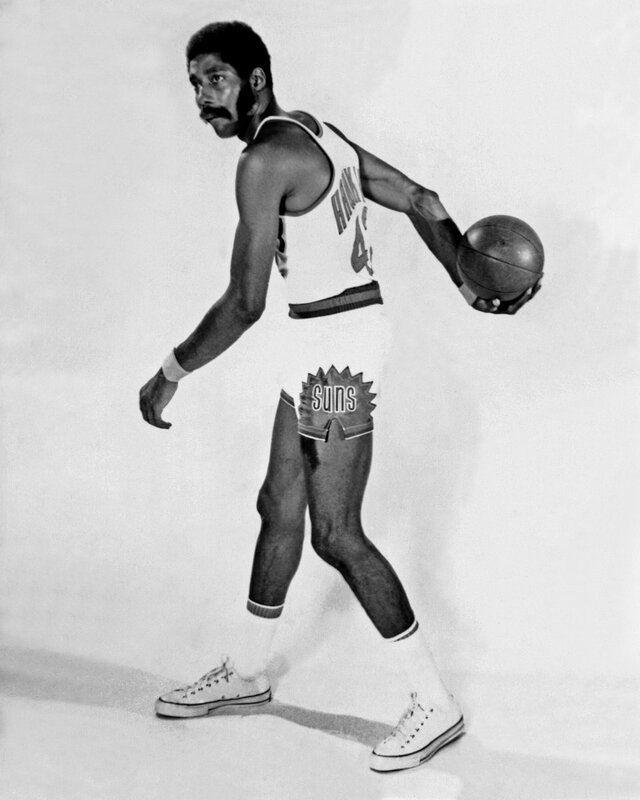 NBA News: Sad News from yesterday: Connie Hawkins (7/17/42-10/6/17) passed away at 75 (check him out in this classic Suns uni) He was “One of the great leapers in basketball history; a forerunner to Dr. J & MJ” (from NBA History). … Hawkins’ Minnesota Pipers warmup jacket is amazing. (He apparently hated it though.) From Casey Common. College Hoops News: I’m not 100% sure, but it looks like the Oklahoma State Cowboys will be getting new uniforms for this season, based on that tweet (thanks, Paul). It appears they’ll be revealed on October 13th. For reference, here is the current orange uni. The WVU logo was commonly used in the 70s. I used to see it in clothing, stationery, souvenirs. My grandmother was from Morgantown and was a graduate of WVU, and always had “swag”. First time seeing that logo. Took me a while staring at it to realize it is a “WVU”. Looked like a double “W” at first glance. It was there in the 80s too. I was a student from 83-87 and it was on all of the university signs and on my orientation materials. I believe it was the official university logo until they decided to consistently brand everything using the flying WV some time perhaps in the early 90s. I remember going to the first game at Mountaineer field in 1980. There was buzz about the team having new uniforms. I thought they might use the logo in question on the helmets, but instead it was the flying WV. The rest is history of course. Pretty darn good logo, that flying WV. Interesting. 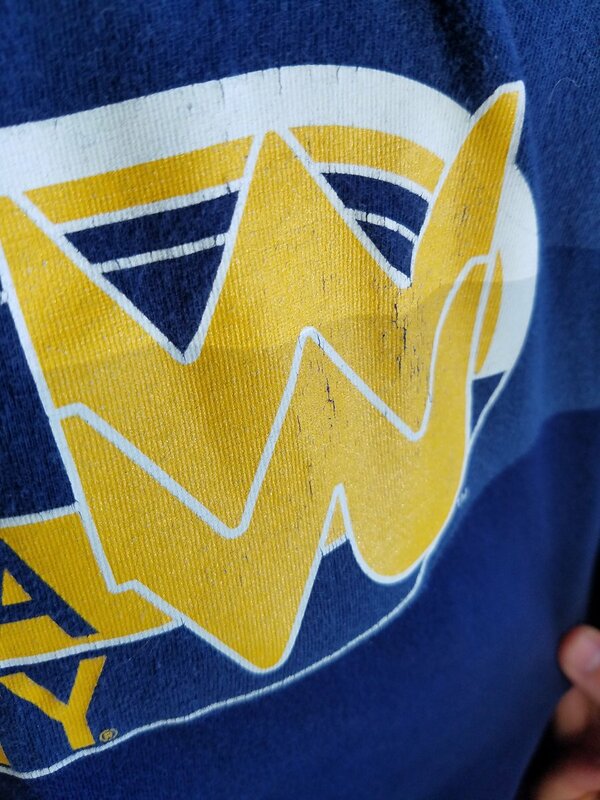 I’m from WV, born in 1980, and I don’t remember anything but the flying W. WVU gear everywhere, but I don’t think I’ve seen that logo before. It was probably disappearing before you got old enough to remember. As I said, it was probably late 80s when they started replacing it everywhere. If you never went to Morgantown you probably never saw it. Yes, the first time I was in Morgantown was the late 90s – long gone by then for sure. My earliest distinct WVU memory is the 1989 Fiesta Bowl v Notre Dame. It is not a good memory – mostly just my dad cursing at the TV. Kansas State at Texas has to make the 5 & 1. No special helmets or throwback/tribute uni’s for that one – great look. It seems like it’s never any Big 12 teams. You’re right though. Should have been#1. The wrong pants, too; Washington wore all-purple against Cal. I know Division 2 doesn’t usually get covered except for the post a few years ago looking at the top 10 teams but I thought we had a nice looking matchup last night. This is Mars Hill University in road white against Tusculum College in home orange. The matching helmet and pants for both teams with contrasting jerseys gave it a nice clean look. I hope the link works. First time trying this. Agreed, that is a good looking matchup. Funny thing is that Tusculum had been all black for better than 15 years (it is a school color) but now with so much BFBS going on they are moving towards the black being an accent color and orange and white being primary. I love the new look and from what I hear the players do too. 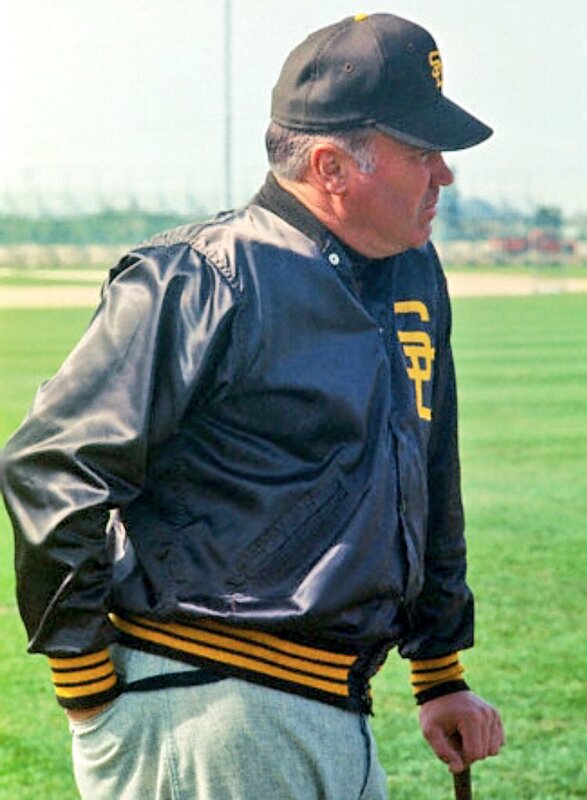 Cool photo of Duke, I would love to have that Padres jacket. Good find. Snider probably worked during spring training, when teams bring in slinstructors who are not part of the permanent coaching staff. For instance, the Yankees used to have Phil Rizzuto, who was never a regular-season coach, work as a bunting instructor in the spring; here he is in the spring of 1977. Whitey Ford and Ron Guidry also served as Yankee spring training instructors in years that they were not on the regular-season coaching staff. 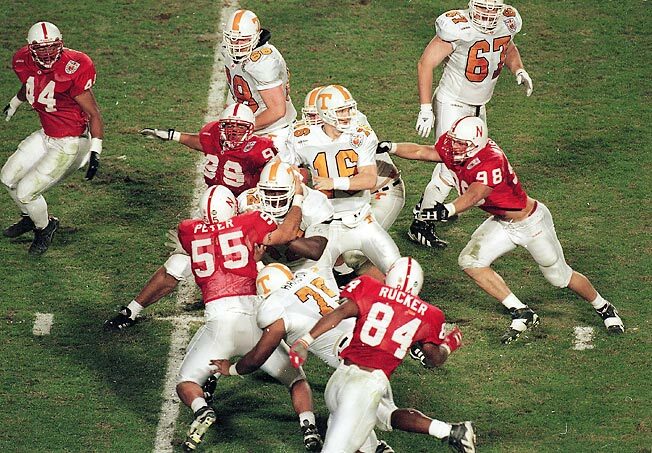 To be fair to the Nebraska players not wearing the double stripped undershirt last night, the stripes were not visible on most of the players during the 1997 season. I thought the mesh numbering was pretty cool–I liked that it was hard to tell. I also appreciated the throw back pants–no stripe. Ha ha! Mono yellow makes the &1 game again! I guess we know what Joe hates most of all! When I submitted the bit about the old hand warmer for the Winnipeg Blue Bombers in Friday’s game, I started to ponder on a similarity to another pro football team. The Blue Bombers returned back to royal blue in 2016, after 21 seasons of wearing navy blue uniforms. 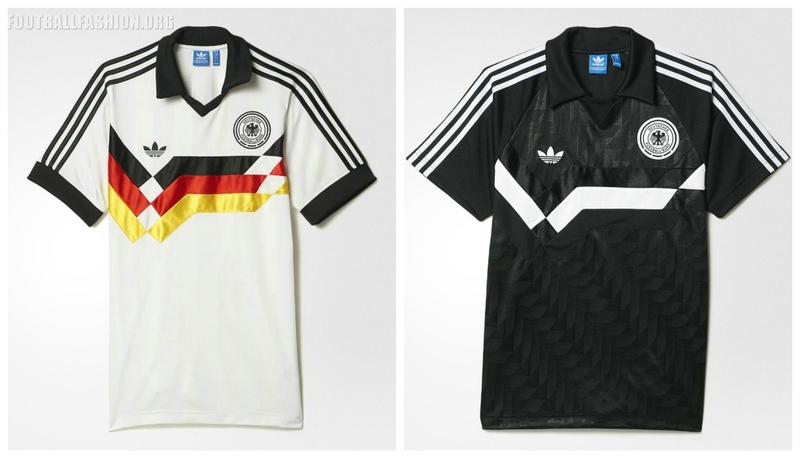 Below is the first version in 1995 and then the last version worn in 2015. This is the 18th season of the Los Angeles Rams wearing navy blue (mostly as St. Louis). Looks like they too may be returning to better looking royal blue, though likely a bit before going 21 seasons in the navy. The Ole Miss Black Bear photo link is incorrect. Thanks for acknowledging the passing of my boyhood idol, Phil. My best to you and Paul. The irony of the video clip of course being that in real life Little Steven is a vigorous advocate of Native American rights (and human rights in general). 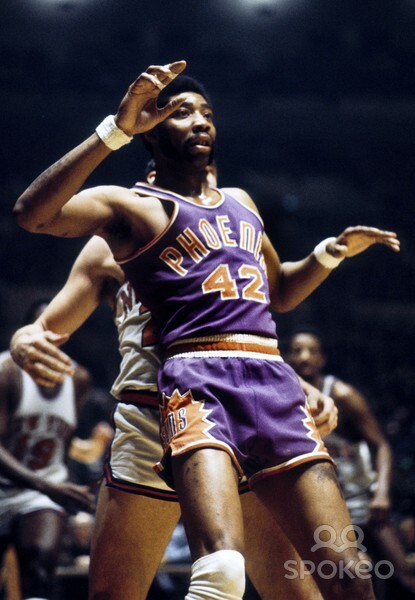 If you’re referring to the “winning tradition” left chest patch, the throwbacks had the incorrect patch. Those last night were the updated winning tradition patch. 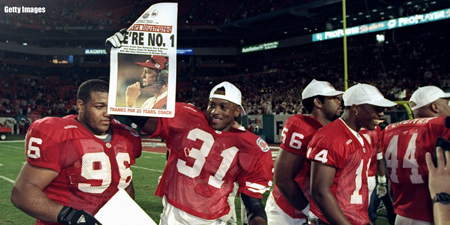 The first two pictures you linked to show the 1997 patch which was red and gray with a gray script “Huskers” over the block “N”. The updated patch is black and red with black block “Huskers” over a red with black outlined block “N”. 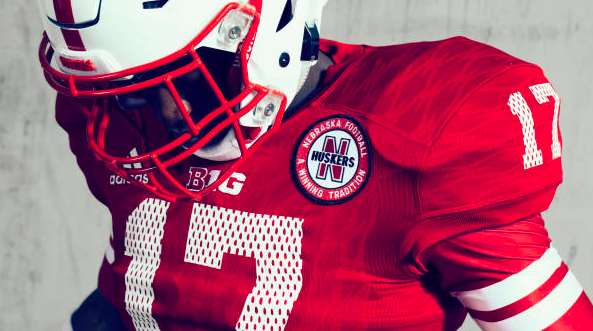 Nebraska totally dropped the ball on those throwbacks. Not remotely like the ’97 version. Tried to link to some pictures but I’m pretty sure I messed it up. I usually like Oregon’s uniform shanagans. I even like mono yellow. I did not like yesterday’s uniforms. Were those supposed to be wings? Sadly, it reminded me of a roadkill bird. Here’s the link for Duke Snider SABR article. I realize this is a blog and not a news site but I come here every day to see what has changed and what is new. It think its pretty lame to not show the ads just because you don’t like it. 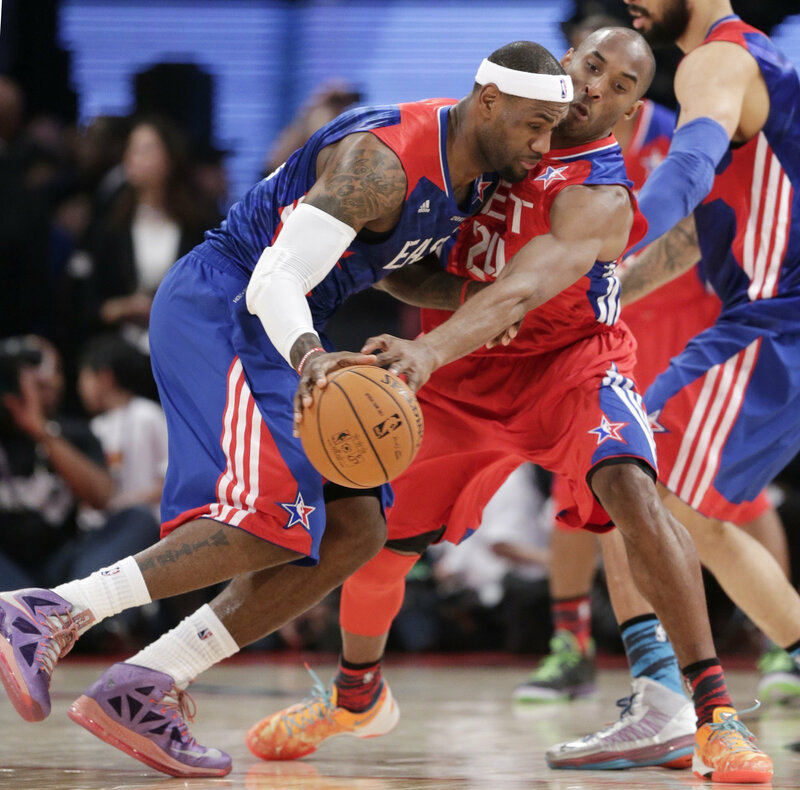 I think it would be more appropriate to regulate NBA uniform ads to the news ticker instead. I probably *will* relegate (not regulate) them to the Ticker from now on — but with Mr. Yuk added to the photos.